Trolls hijacked a scientist’s image to attack Katie Bouman. They picked the wrong astrophysicist. As the world stared in wonder this week at the first image of a black hole, a new star was born here on Earth: Katherine Bouman, a 29-year-old postdoctoral researcher who developed an algorithm that was key to capturing the stunning visual. On the ugliest corners of the Internet, however, this sudden fame for a young woman in a male-dominated field couldn’t stand. 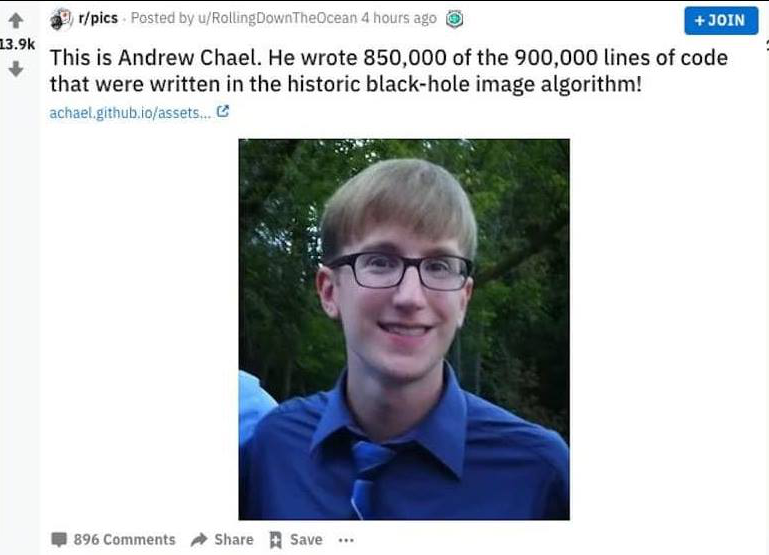 A corrective was quickly found in Andrew Chael, another member of the Event Horizon Telescope team, who, not coincidentally, is white and male. The implication was clear: Bouman, pushed by an agenda-driven media, was getting all the attention. But Chael had done all the real work. That’s completely wrong, Chael said in a viral Thursday night Twitter thread of his own. Not only are the claims in the meme flat-out incorrect, but Chael — as an openly gay man — is also part of an underrepresented demographic in his field. “While I appreciate the congratulations on a result that I worked hard on for years, if you are congratulating me because you have a sexist vendetta against Katie, please go away and reconsider your priorities in life,” he tweeted. “It was clearly started by people who were upset that a woman had become the face of this story and decided, ‘I’m going to find someone who reflects my narrative instead,’” Chael said in an interview with The Washington Post. But those who sought to diminish Bouman’s work — especially while boosting Chael in her place — were making an absurd argument, the astrophysicist said. The New Mexico native is on the Outlist of LGBTQ scientists in the astronomy and astrophysics fields, and advises gay undergraduates at Harvard. “Yes, that was ironic that they chose me,” he said. Despite having to speak out against the backlash, Chael said he’s also been heartened to see Bouman’s work held up as an inspiration and hopes it leads to more women in astrophysics and astronomy departments. “I don’t want to downplay the fact that it’s a very male-dominated community, especially radio astronomy,” Chael said. “There are less women there than even in other fields of astronomy, which we have to work hard to change." A column suggested waiters could ‘tamper’ with Trump officials’ food. Amid backlash, the Boston Globe pulled it.